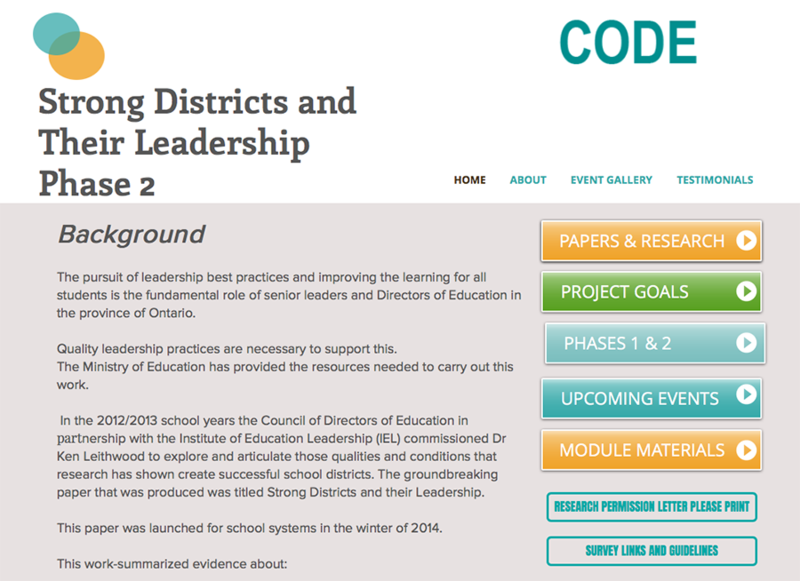 Beginning in the 2012/2013 School Years the Council of Directors of Education (CODE) in the province of Ontario commissioned Dr. Ken Leithwood to document the qualities and conditions of Strong School Districts. The purpose of providing this evidenced based paper was to identify the key practices and conditions that district leaders strive to implement in a successful school district. 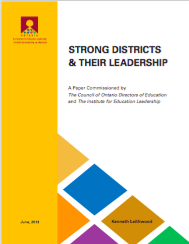 The document called Strong Districts and Their Leadership was published as a result, which outlines the (9) practices of Strong District Leaders. The project and the engagement of system leaders in the Province of Ontario has been brought been put in place in two distinct phases. This was inclusive of the development and field-testing of learning modules connected to the (9) characteristics of Strong Districts. This phase is intended to deepen and extend the results of the previous research. It included the creation of 8 learning modules in addition to the research strand. Phase Two of this work assesses not only how the Strong District characteristics influences student success but also the extent to which the (9) characteristics influence student success through their impact on schools, classrooms and families. Phase Two also explores what combinations of district; school and classroom variables influence student outcomes such as engagement, achievement and equity. The focus is to ultimately deepen our understanding of how districts are engaged in practices around the (9) characteristics. Another valuable component of this work is the level of professional development that the project has continued to develop and foster. Our goal continues to urge school districts to de-privatize their practices and share their approaches during the learning modules, through the provision of case studies and ongoing application to their work. In addition an Advisory committee of Directors, Superintendents and Ministry staff provided insight and direction at regular scheduled milestones that guided this next phase approach. To document and share the work learning hub (website) was created as a repository for the learning modules inclusive of case studies and a compilation of the related research that coincided with the module topic. "A Powerful Professional Development Opportunity for Senior Leaders"
A summary document has been developed by Ken Leithwood and Catherine McCullough to highlight their professional development for Senior Leaders. This activity is endorsed by CODE and a number of district school boards are currently involved. Click here to see this new document.